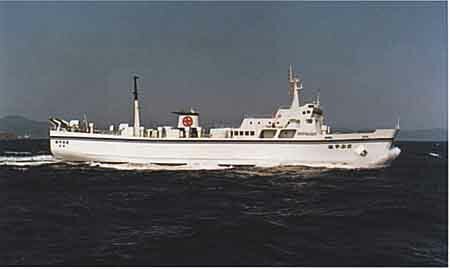 In May, 1995, car ferry HAYABUSA having unique propulsion system consisting of two fixed propellers driven by one diesel engine was delivered by The Hakodate Dock Co., Ltd. to Kyoei Unyu Co., Ltd. who operates the ship in regular service on the route between Hakodate and Aomori. The propulsion system achieves excellent maneuvering performance as similar as ships equipped with controllable-pitch propellers and the same system have never been recorded in Japan. The ship is a full super structure decker with an efficient bulbous bow and a split-stern. The engine room are located amidship. For the loading and unloading of vehicles of 23 trailertrucks in maximum, the ship has a liftable type bow-visor at bow and outboard ramp at the stern. The ship is protected from rolling by fin stabilizers installed amidship. Bow thruster and K-7 type flap-rudder are provided for easy and safe maneuverability. The main engine, fin-stabilizers and bow thruster are remotely controllable from the navigation bridge as well as the control room in the engine room. The main switch board is equipped with auto-starting, auto-synchronizing and auto-frequency control for stand-by generator.